It only stands to reason: If you put toxic chemicals into your products (say, sunscreen or baby shampoo) at the factory, you’re going to wind up with toxic sunscreen and toxic baby shampoo, toxins in workers and your community, and toxins in beachcombers and babies. The Story of Stuff Project’s Annie Leonard describes bathrooms all over America that are minefields of chemical nasties, most of which have links to asthma, learning disabilities, birth defects, and the big “C”: cancer. 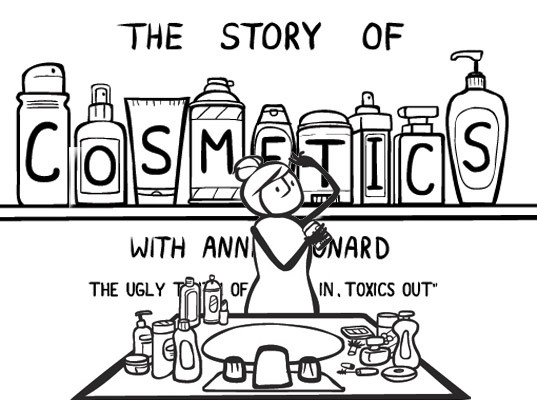 Take just seven minutes of your time today to watch Leonard’s animated short about the ugly truth behind our beauty and personal products. Then pass it on to your family and friends. A groundbreaking legislation, the Safe Cosmetics Act of 2010, was introduced in Congress today. Leonard’s video comes at a pivotal time in U.S. history. A groundbreaking legislation, the Safe Cosmetics Act of 2010, was introduced in Congress today—the first in 70 years we have the opportunity to pass a bill that would put the kibosh on toxins we put on (and in) our bodies every day. Want some extra credit? Reach out to your U.S. Representative to co-sponsor the Safe Cosmetics Act of 2010. It only stands to reason: If you put toxic chemicals into your products (say, sunscreen or baby shampoo) at the factory, you're going to wind up with toxic sunscreen and toxic baby shampoo, toxins in workers and your community, and toxins in beachcombers and babies. The Story of Stuff Project's Annie Leonard describes bathrooms all over America that are minefields of chemical nasties, most of which have links to asthma, learning disabilities, birth defects, and the big "C": cancer.